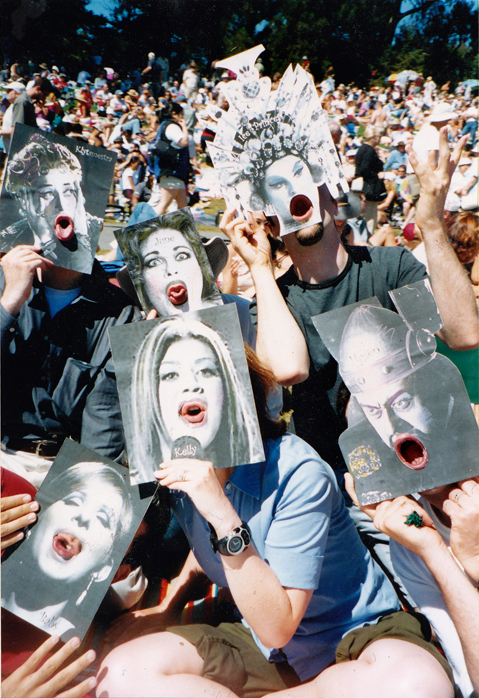 Just when the dust began to settle on the DIVA Totem Pole, the 2002 SF Opera in the Park rolled around. Knowing the bar was high, and wanting to make it even more fun for friends, I took a different strategy: interactivity! I sourced the most iconic and expressive diva portraits I could get my hands on to create quickie cut-out masks. They had to be high-resolution enough to print out cleanly at actual size. This was during my heyday of designing the SF Ballet Nutcracker collateral. I had just used a similar mask idea for their direct mail brochure, with many of the characters from their production (but with eye holes, rather than mouth holes). I dug up hot shots of Birgit Nilsson’s icy Met Turandot (complete with one ton bejeweled crown), Regina Resnik’s tragic Klytemnestra, and June Anderson mugging in a photoshoot. But, I branched out a bit too, including Wagnerian basso Hagen (with imposing helmet, singer unknown), as well as two popular divas: 1960’s “Color Me…” Barbra, and AI Kelly “Moments Like This” Clarkson. The pictures make me laugh out loud every time I rediscover them. The lips look positively labial. I reigned over the proceedings here as Turandot. A Streisand fanatic friend immediately got his paws on Babs (and even did her mannered hands, see above). My friends brought these TO LIFE! As I sign off for now, I share with you Nilsson singing Turandot’s ruthless aria “In Questa Reggia” (and lookin’ like buttah) at Arena Macerata in ’71, for some bonus dementia!